Thank you so much for working with me and all the challenges I have presented you. 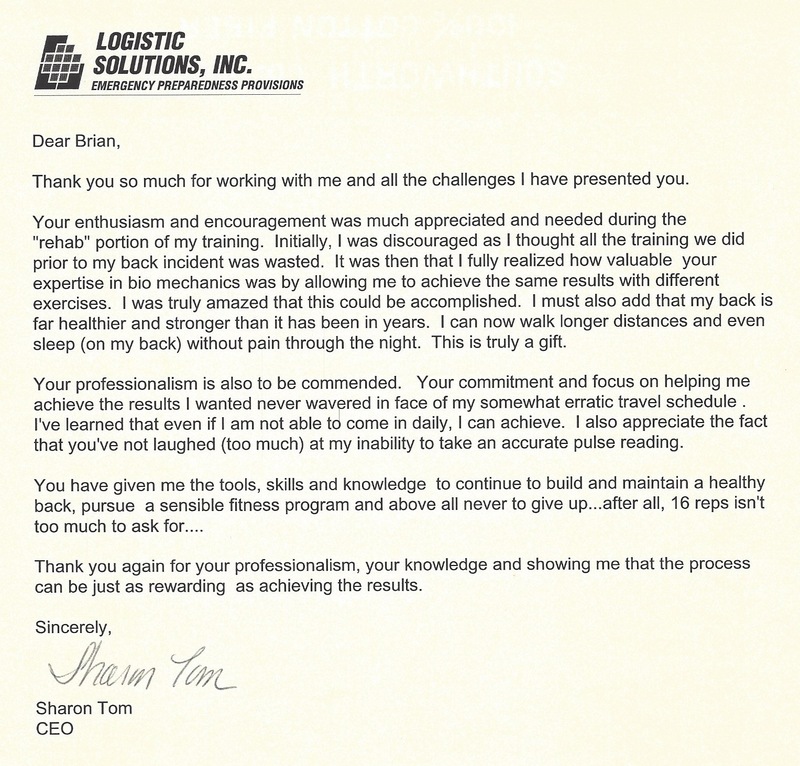 Your enthusiasm and encouragement was much appreciated and needed during the “rehab” portion of my training. 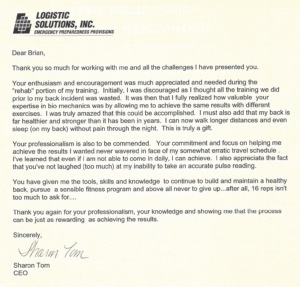 Initially, I was discouraged as I thought all the training we did prior to my back incident was wasted. It was then that I fully realized how valuable your expertise in bio mechanics was by allowing me to achieve the same results with different exercises. I was truly amazed that this could be accomplished. I must also add that my back is far healthier and stronger than it has been in years. I can now walk longer distances and even sleep (on my back) without pain through the night. This is truly a gift. Your professionalism is also to be commended. Your commitment and focus on helping me achieve the results I wanted never wavered in face of my somewhat erratic travel schedule . I’ve learned that even if I am not able to come in daily, I can achieve. I also appreciate the fact that you’ve not laughed (too much) at my inability to take an accurate pulse reading. You have given me the tools, skills and knowledge to continue to build and maintain a healthy back, pursue a sensible fitness program and above all never to give up…after all, 16 reps isn’t too much to ask for…. Thank you again for your professionalism, your knowledge and showing me that the process can be just as rewarding as achieving the results.